An authentic suit of armor. For the second year, the Faire takes place Saturday and Sunday, Sept. 1-2 at 784 Shingle Mill Rd. at the Rockin’ O Ranch from 10 a.m. to 6 p.m. both days. Admission is $10 for adults and $5 for children aged 5 to 17. Children under 4 attend free. Bring a bag of canned goods to donate to the Bonner County Food Bank and get a $2 discount off the ticket price. 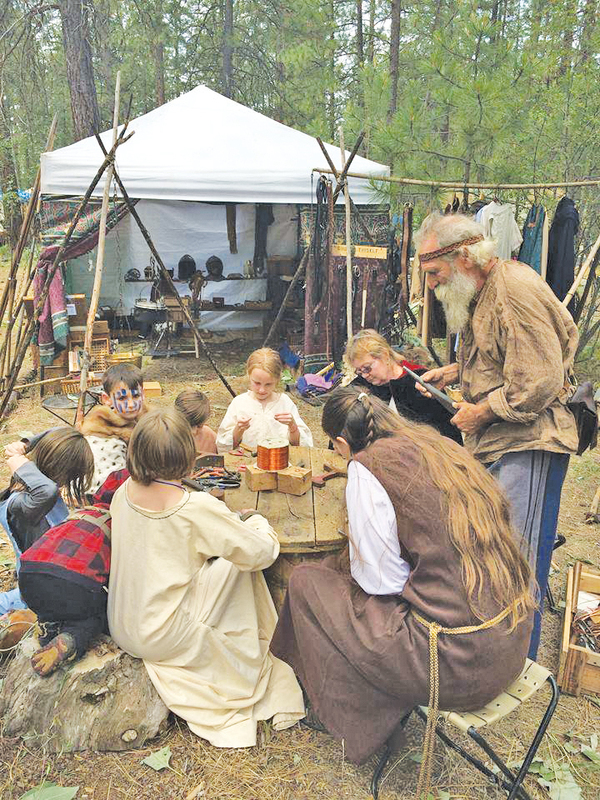 Organizer and member of the Sandpoint Renaissance Fair Association Tonya Anderson said this year’s Faire comes on the heels of a successful inaugural event last year. The Renaissance Faire will feature a wide variety of Elizabethan-style events and entertainment, including loads of live music, artistry, food and crafts vendors, two jousting performances each day at 11 a.m and 5 p.m., belly dancing, boffering demonstrations open to the crowd, turkey drumsticks, an ale house operated by local Vietnam veterans pouring Kootenai River Brewing Co. beer complete with “wenches” to serve your ale or wine and much more. There will even be a man with a pet hawk. Anderson said the Faire was founded after getting inspiration from attending the Sandemonium fandom convention a couple years ago. There’s always something for the little ones to do at the Faire. Courtesy photo. 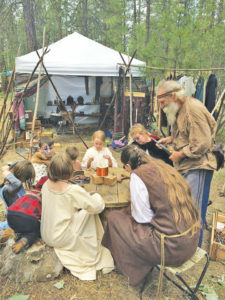 The two-day event is fun for all ages, with an arts and crafts area where kids can make crowns and shields to decorate, and a fairy realm children’s area to explore. Anderson said she’s always been drawn to this culture, and that the faire is a great place to immerse yourself in fantasy with the acceptance of those in attendance. A big part of the Faire is the assortment of live music throughout the weekend. Rebel Times, a Medieval style band, will captivate the crowd with their unique brand of Celtic, period music. The Back Porch Fiddlers will also play, as well as Fiddlin’ Red and Desiree Aguirre and Margie Cook from the Music Conservatory of Sandpoint. A jouster prepares for glory. Courtesy photo. Anderson said any businesses that wish to sponsor or donate to the association will enjoy tax deductible status because they are a nonprofit organization. Also, the Faire will be collecting canned goods to donate to the Food Bank. “Last year we raised over 300 pounds for the Food Bank and we’re hoping to beat that goal this year,” Anderson said. While many show up dressed in costume, the Faire is open for anyone and everyone, costume or not. 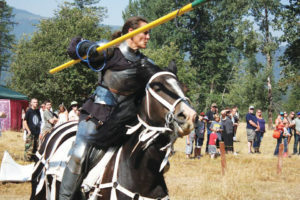 Check the Sandpoint Renaissance Faire Facebook page for more information.